My reading habits have, as an adult, always been fairly predictable. I like fluffy chick lit. I’m not ashamed of it either. I’m more than capable of deeper, more meaningful, insightful reading. But there’s something about the cosy warmth of a book where you know, in the first few chapters, that two of the main characters will end up in a relationship. Wondering how they’ll get there but knowing they will. It’s a personal indulgence, and I rarely deviate. 18 months ago though, during our week in Greece, I did deviate! Unusually, for me, I squeezed some paperbacks into my luggage (I’m usually too laden down with shoes and have been relying on an ereader in recent years. But it’s just not the same). And our apartments had a swap bookcase, where you could leave your read books and pick up something left by another visitor. Weirdly my eye was drawn by The Couple Next Door by Shari Lapena. It didn’t give me the usual immediate squishy feels. The contrast between the high drama of the book and the relaxed nature of lying on the beach and occasionally paddling in the sea was strange, but I devoured it. I couldn’t wait to read the next chapter, the next twist, and find out what the ending would be. I always read voraciously, but in a “predictable” book (and I say that in the nicest possble way) there isn’t the same intensity and urgency. 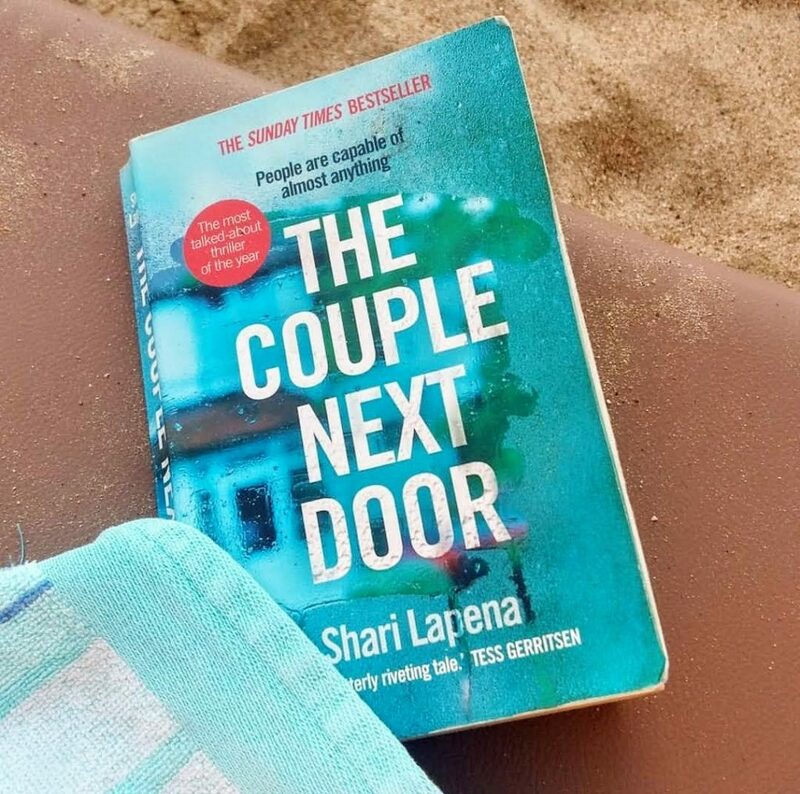 In case you haven’t read it, the premise of The Couple Next Door is around the kidnap of a baby which has happened while the parents were next door having dinner with their neighbours. They have a baby monitor with them and they’re only footsteps away, so what could possibly go wrong? Quite a lot, as the book goes on to detail, with twists and turns right up until the very end. Thriller fan or not, I would definitely recommend it! What effect have these changing reading habits had on my choice of books since? I now actively seek out thrillers as an alternative to my set ways of reading, and I have to say I can’t get enough! I stock up for bargain prices during charity shop binges so I always have a pile to get through. Do you have a genre of choice when it comes to reading? Have you read The Couple Next Door? Let me know in the comments! 7 books for 7 pounds? Yes please! I’ve always been a voracious reader. Not for me a couple of pages before bed and taking weeks to finish a book. If I start a book I’m committed to it and I allow it to take over. I’m immersed in the story and the characters (assuming said book is well written) and I just NEED TO KNOW WHAT HAPPENS. Many a time on holiday we’ve been later than planned for lunch or dinner because I’m reading “just one more chapter” which we all know is nothing like one chapter and probably more like four. When I was a kid we used to go to the local public library where you could only take out six books at a time. I used to pore over the shelves, thinking how best to use my meagre allocation and, by the time we got home, I was chomping at the bit to get started. It wasn’t unusual for me to read a book in one sitting, and I’d usually have got through all of them way before it was time to go back the following week. As an adult I read less, due to time constraints and life getting in the way, but when I do read I still do so in the same way. Nose down, devouring the pages and feeling thoroughly engaged. If we’re on a relaxing holiday I like nothing more than spending the day at the beach or by the pool with a book for company. If we’re going on a holiday where there is little relaxing time because it’s all about sightseeing, I often choose not to take a book, even for the journey, because I know it will consume my thoughts and eat into my time when I should be out looking at what the world has to offer! When e-readers became de rigeur, I was slightly appalled (I’d hate books to become extinct) but I could see their appeal – so many books in one lightweight easy to carry place; perfect for holidays where luggage allowance is needed for shoes! And so I bought one (a Nook, now extinct as a company) and I loaded it with all manner of tomes, and I read The Great Gatsby on it the first day I got it. Ebooks were cheap and easy to download and the reader had a really long battery life but I didn’t love it. I missed the smell, and the page turning, and seeing how much book you have left. I missed physical books. There’s always at least one book on my Christmas list, which I may or may not get round to reading immediately! I always have a pile of physical books which I haven’t yet read, collected from one source or another. But I never buy books from new myself. Being the greedy reader that I am, it’s a really expensive way of reading, when there are much more economical options. Charity shops are a veritable feast of books – paperback, hardback, fiction, autobiography; they have everything you can imagine. Ranging from tatty and dog-eared (well loved, as I prefer to think of them) through to like new condition, it’s a great way to bring purpose to something that’s otherwise bound for the scrap heap AND support a good cause. I know there are purists who argue that the author is missing out because they’re not getting the royalties from a new sale. In my case that’s not true at all. I wouldn’t buy the book brand new, so they’re not losing a sale. They’re gaining an audience, and an appreciator, and potentially a recommender who will talk about their works to other people, in real life or on social media. My most recent find is our local Acorns Childrens Hospice charity shop. I say “find”, it’s in the village where I have lived for 12 years. I’m not usually out in the village having a mooch during shop opening hours though, so I rarely go in there. 2 weeks ago I popped in and came out with a couple of books (then another 4 from Oxfam). I started off by reading Eleanor Oliphant is Completely Fine, which I really enjoyed. It was a very different protagonist to the usual type, and I did go through a stage a few chapters in where I didn’t like Eleanor very much and so I started to struggle with the book, but I’m glad I persevered. Last week I went back to the charity shop and came out with 7 books! Charity shop prices for second hand books often depend on size or condition, but our local Acorns has a £1 per book policy across all paperbacks. One of these is completely unread with not a mark on it, and I’d say all of the others have been read once and are in immaculate condition. Total value of £55.93, all for £7! The beauty of reading this way is that you can afford to step out of your comfort zone and try a genre or author you wouldn’t usually go for, because if you don’t like it you haven’t wasted a lot of money (well technically you haven’t wasted any money, as it’s gone to a good charitable cause). Also, once you’ve finished, you can donate them back to the charity shop of your choice, thus continuing their fundraising capability. Are you an avid reader? Do you buy pre-loved books? Let me know in the comments!